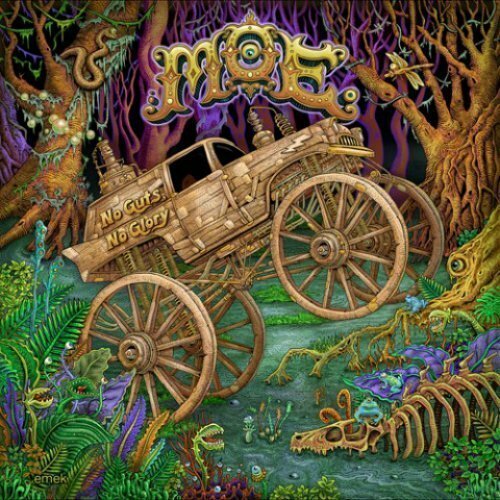 American jam band moe. show no signs of resting on their laurels, because they have released their 12th studio album, No Guts, No Glory, via Sugar Hill Records. You can stream the album above. The album kicks off with "Annihilation Blues," an uptempo tune dominated with catchy riffs and an anthemic chorus. "White Lightning Turpentine" features steady finger picking and distorted slide guitar, giving it a country twang vibe. "This I Know" contains confessional lyrics, while "Same Old Story" has a haunting, surf rock feel to it. "Silver Sun," one of the two songs on the album that nears the ten minute mark, begins with a steady groove leading into a jammy guitar solo. Dreamy vocals kick in at the 4:20 mark before the guitars carry the tune into an energy driven force of nature. "Calyphornya" starts off with Alice In Chains- style strumming with a grunge sound that harkens back to the early 1990s. The playful "Little Miss Cup Half Empty" is a ska up-stroke reggae tune that is a perfectly placed prelude to the bouncy, horn-driven "Blond Hair And Blue Eyes." Closing the album is the tour de force "Billy Goat" that features funky bass slapping, rising crescendos, and an exploratory jam that is sure to be a face-melter when played live. Sometimes you have to adapt on the fly and just improvise. We had these songs that were written with an acoustic album in mind. But we ended up making a whole different thing. As we were recording, we decided it would be good to have some acoustic instrument on every song. So, while we were plugged in and had full drums, there is also an acoustic element running throughout the album. The 11-track album is under an hour long and contains all the ingredients of various musical styles that moe. have developed in their twenty-five year career. Various percussion instruments, guitar shredding, acoustic finger picking, and soaring melodies make this a quintessential album in every moe. fans' collection. 7. "Little Miss Cup Half Empty"
8. "Blond Hair And Blue Eyes"
10. "The Pines And The Apple Tree"
No Guts, No Glory is currently available through the Sugar Hill Records official website, iTunes, and Amazon. For additional music news and information, check out the moe. official website.